I was fascinated by this idea on a number of levels. The first to get out of the way is incredulity at the idea that a combination of the above would produce similar results to the training regime of an Olympic athlete, unless we’re considering pistol marksmen/women, or some similar sports person. I think most people conjuring the idea of an Olympic athlete will come up with someone like Usain Bolt, Jessica Ennis, Chris Hoy, Tom Daly etc. I know that Usain Bolt is notoriously lackadaisical about his training but I cannot believe that a similar physical condition could be achieved through yoga, pilates and nutrition, with some treatments thrown in. I specifically referred to Usain Bolt’s physical condition to avoid using the word fitness. This is the part of the ‘fit as an Olympic athlete’ concept that I find really interesting. How are we to define fitness? And will Olympic athletes fit into that definition? I asked a friend of mine, Pilates teacher Suzanne Scott, “an anatomist with physiology leanings”, to define fitness for me recently, and this is what she came up with: “greater tolerance to shifts in environmental parameters and biologically mediated challenges”, which, aside from being marvellously worded in a very science-y way, captures an evolutionary notion of fitness rather well, and I shall return to this. Biology online says: “In biology, Darwinian fitness or simply fitness of a biological trait describes how successful an organism has been at passing on its genes. The more likely that an individual is able to survive and live longer to reproduce, the higher is the fitness of that individual.” Hence ‘ survival of the fittest’ – those that are best adapted to be able to successfully pass their genes on to successive generations. (This perhaps calls for a separate post on how our species has nearly circumvented this simple evolutionary rule by inventing agriculture, with its attendant advantages and disadvantages). As sports science and our understanding of human physiology and biomechanics has developed the level of performance has risen to a staggering degree (world best marathon time teetering on the brink of the 2 hour barrier being broken!). To be ‘elite’ means monitoring the minutiae of an athlete’s life and training, and competing at the very edge of one’s potential. Pushing to that ‘edge’ inevitably means that many athletes seem to be, even when performing very well, on the verge of injury and/or illness. To be really successful as an athlete means maximising your adaptation to your chosen activity. This adaptation ultimately means that an athlete’s body starts to dispense with any tissue that doesn’t help perform the relevant specialisation, whether it be muscle, bone or brain! If you need to be as light as possible to be really good at your chosen sport then your ability to store energy is going to be compromised. This is fine if you have a ready supply of food, but could lead to catabolism (something like your body ‘eating’ your muscle tissue) if not. However impressive a lot of sporting achievements are, and how much I enjoy watching them, this doesn’t feel like a model of fitness to me. While some elite athletes might do very well within the prehistoric framework mentioned above, I suspect that many would have trained the necessary versatility out of themselves, in order to be highly skilled at their specific event. 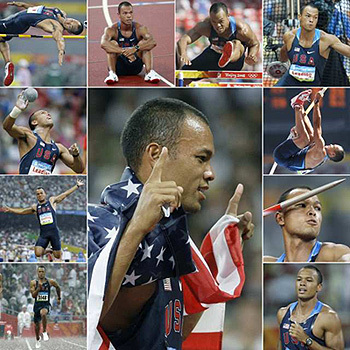 An honourable mention is due the Olympic decathletes, like Brian Clay (pictured), whose multi-sport discipline of running, jumping, throwing and vaulting (an amazing combination of movements) requires them to have a truly impressive combinbation of strength, speed, stamina and agility. Okay, so I’ve succeeded in arguing that actually some Olympians do qualify as really fit – not my original intention. I still stand by the argument that, very often, the requirements of elite sporting performance are incompatible with a Darwinian interpretation of fitness. Given that, let’s return to what does qualify as fitness, or what does “greater tolerance to shifts in environmental parameters and biologically mediated challenges” really mean? Can you cope with unexpected challenges to necessary or normal activity? (I wrote about how Pilates relates to this here). If you’re a slight framed woman driving an Audi Q7 around London’s streets (yes, I’m a cyclist), and an electronic malfunction means that your power steering is disabled, can you control your vehicle? If you live on the 6th floor, and the lift is out of order, can you get your 20 kilos of groceries upstairs to your home? If you’re a 70 year old out for a stroll and some lunatic on a bike appears from nowhere heading straight for you, do you have the speed and agility (and balance) to get out of harm’s way? I’m sure we could come up with infinite examples of such scenarios. An answer of “yes” would suggest that, having a greater tolerance to …, you are more fit than some. Let’s not say that a ”no” answer means that you are unfit, rather that you could be fitter. The truth is that many, many people will get by, and quite possibly even thrive, without the skills to make it within the prehistoric framework. I would suggest that this only serves to show that our species is weaker than it once was. Thanks, interesting and thought provoking Mike!